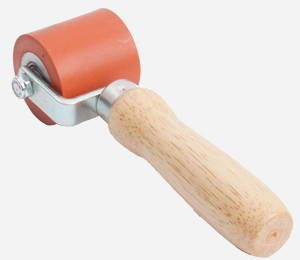 50mm wide x 50mm diameter silicone seam roller with wooden handle. 25mm wide silicone roller with wooden handle. 45mm wide silicone seam roller with ergonomic rubber handle and seam tester for checking welds. 45mm wide silicone roller with ergonomic rubber handle. 45mm wide silicone roller with wooden handle. Polyamide cone-shaped seam roller with wooden handle, preferred by some for detailed work.